Once you acquire the spectra, it is time to identify your edge of interest. Edge identification can be done three different ways in Gatan Microscopy Suite® (GMS) 3 software. Use the AutoID function in the Elemental Analysis window of the technique. When you select the AutoID button it will show candidate edges on the spectrum. You will need to verify these edges using the common identifiers defined above. 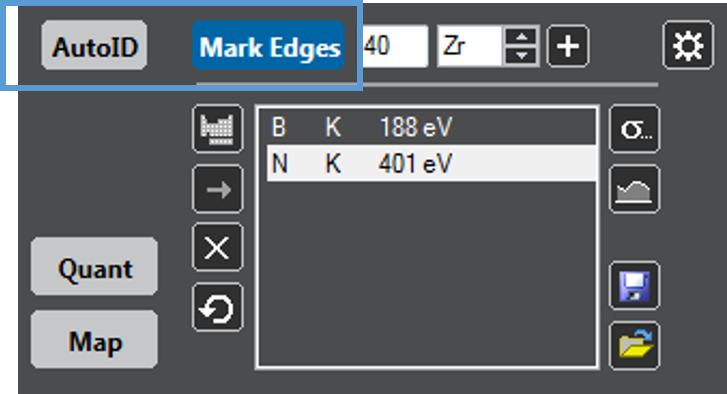 To aid in this task the Mark Edges button can be used to show edge families. Once verified, you can then add them to the quantification list by pressing the → button to the left of the list. Your second option is manual identification . 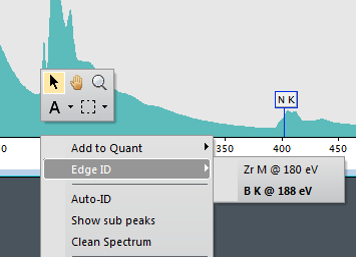 By right clicking on the spectrum itself, you will see the Edge ID menu where candidate edges are shown. The most probable edge will be in bold. You can add that edge to the quantification by using Add to Quant menu choice. The third option for identification is through the period table interface. To reach this option, click the Open Periodic Table icon on the Elemental Analysis window. This will in turn open a periodic table where you can directly select known elements to automatically add them to the quantification. Delayed edge features, plural scattering and overlapped edges can sometimes make edge identification difficult. Compare the acquired spectra to reference data (e.g., from the EELS Atlas) if you suspect overlapped edges or see unusual edge shapes. If the element has multiple edges available, confirm the existence of these features in you experimental data for unambiguous identification. Here the B K-edge overlaps strongly with the P L­-edge. Comparisons with a P standard would show the B feature is not present. Small concentrations of B may be hard to extract in this case. Ahn, C. C.; Krivanek, O. L.; Disko. M. M. EELS atlas: a reference collection of electron energy loss spectra covering all stable elements. HREM Facility, Center for Solid State Science, Arizona State University; 1983.